Nicole? Papa! Yes it can only be the Renault Clio. First launched in 1990 the Clio has become a staple of the super competitive Supermini class, but is there more to the 4th Generation model than some slick advertising? Renault knows a thing or two about engines and the 998 cc triple is a good example of its expertise. In ‘ECO’ specification it produces a touch more torque than the standard unit and produces the same power but 250 rpm earlier. Despite a small torque advantage the ECO is slower to 62 mph because it is mated to a 5 speed gearbox with taller ratios which along with super low rolling resistance tyres explains the better official fuel consumption. Unusually Renault hasn’t fitted direct fuel injection which means that petrol particulate emissions aren’t an issue and this along with the smooth revving nature of the engine makes it a good fit for a Supermini which is likely to spend a lot of time in urban environments. One thing the Clio has always had on its side is style, and this iteration is no exception. It is a good looking car inside and out. In general the material quality is good too and in combination with suspension that provides a good mix of fun and comfort it is easy to make a case for heading out of the city too. 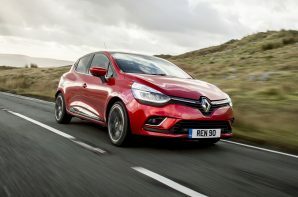 The Clio is a strong package delivering efficiency, style, fun and comfort. It can’t quite match the Fiesta for out right driver involvement but it does a good job of keeping you interested without resorting to overly stiff suspension. Performance is right on the money and speaking of finance it is keenly priced too.